Oklahoma City-County Health Department (OCCHD) epidemiologists will use data from the following sources: temperature, mosquito trap counts, disease rate within captured mosquitoes, complaints from residents, human surveillance which includes West Nile Virus (WNV) cases in the state and throughout the Oklahoma County area to determine the risk. OCCHD Public Health Specialists and Epidemiologists remind us this is a guide for the entire county. These factors are known to increase the risk of WNV to the residents. This tool is a way to quantitatively and consistently monitor and compare risk of human West Nile infection. 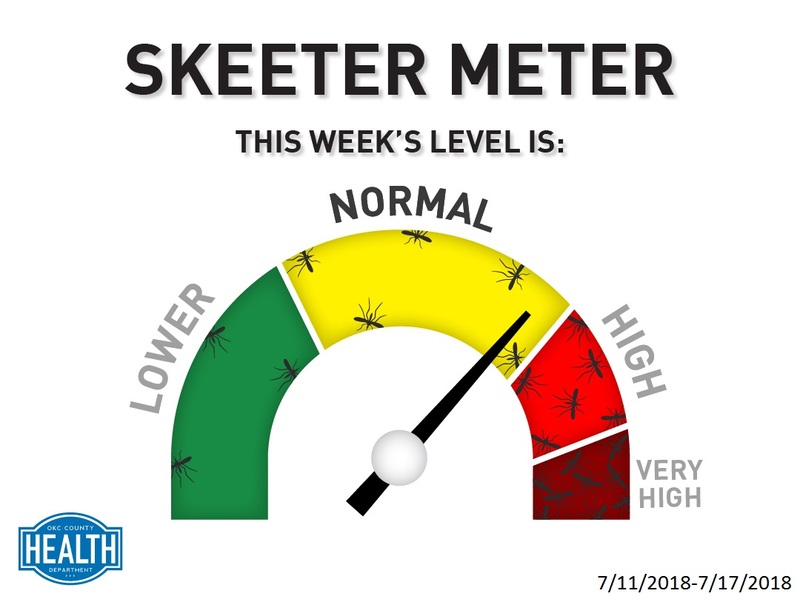 This week's Skeeter Meter risk number is in the normal range at 3.75. DRAIN standing water on your property. DRESS in long sleeves and pants that have been sprayed with repellent. PROTECT by limiting exposure outside and check window screens. Go to www.fightthebiteok.com for more information.